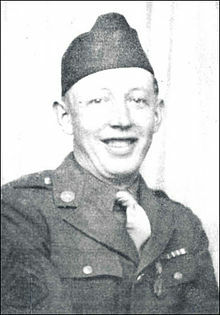 Frank D. Peregory was a United States Army technical sergeant who posthumously received the United States military's highest decoration for bravery in combat, the Medal of Honor, for his actions during World War II. In a previous incident, he also received the Soldier's Medal for rescuing another soldier from drowning. Peregory grew up in a large family in Virginia and although he was only 15 years old, in 1931 he lied about his age in order to join the Virginia Army National Guard. When the United States entered World War II in December 1941 his unit was activated and while guarding a beach Peregory received the Soldier's Medal for saving a fellow soldier from drowning. When the unit arrived for combat overseas they were assigned to the D-Day invasion of Normandy and Peregory again risked his life by single-handedly attacking a fortified German machine-gun emplacement, killing several and taking more than 30 prisoners. For his actions during the battle he later received the Medal of Honor. 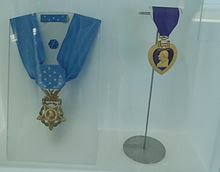 The Medal was presented posthumously, however, because on June 14, 1944, six days after the action for which he would be awarded the Medal of Honor, he was killed. He was born April 10, 1916 at Esmont, Virginia, and grew up in a large, impoverished, but tightly knit family in Albemarle County, Virginia. His family name is actually spelled "Peregoy" according to historian Richard H. Britton, although most references spell his name "Peregory." His birth year is also typically given erroneously as 1915, possibly because he originally lied about his age at enlistment. Peregory's mother died in 1931, forcing him to quit school to help his father support his seven siblings. In May, Peregory joined Company K (Monticello Guard) of the 116th Infantry Regiment of the Virginia National Guard at Charlottesville, the seat of Albemarle County. Because Peregory was only fifteen at the time, he lied about his year of birth, and this misinformation became part of his permanent record along with the presumably accidental misspelling of his surname. In 1941, Peregory married Bessie Kirby. Before the entrance of the United States into World War II, Peregory's unit was inducted into federal service on February 3, 1941. As a member of the 29th Division Peregory moved with it to Fort Meade and the unit began training for participation in the war. While patrolling a beach in North Carolina shortly after the Pearl Harbor attack, Peregoy rescued a drowning comrade. In recognition of his action and disregard of danger to himself, he was awarded the Soldier's Medal, the highest non combat award that a soldier can receive for saving a life. The 29th was then sent overseas to train in Scotland and England for the next two years. The 29th was selected along with the Regular Army's 1st Infantry Division to attack one of five fortified beaches, codenamed "Omaha". After the assault had been postponed several times, on June 6, 1944, Peregory landed with the 116th at Omaha Beach as part of the Normandy Invasion, also known as D-Day. His unit was among the first wave of troops to assault the beach but despite fierce enemy resistance that included heavy shelling and machine gun fire, his unit made its way to the town of Grandcampe, by June 8. Six days later, Peregory was killed while fighting in the hedgerows. He is buried at the American Battle Monuments Cemetery in Normandy also known as Normandy American Cemetery and Memorial in Colleville-sur-Mer Basse-Normandie Region, France. His grave can be found in section G, row 21, grave 7. On June 5, 1945, Peregory's widow was presented her husband's Medal of Honor in Charlottesville's New City Armory. A building complex at Fort Pickett in Virginia was dedicated to Peregoy in 1984. In June 2010 a rededication ceremony was held and a new monument was unveiled with descriptions of his actions regarding the Medal of Honor and the Soldiers Medal. The Frank D. Peregory United States Army Reserve Center, located in Charlottesville, Virginia is named in his honor as well as the Frank D. Peregory Fitness Center located in Camp McGovern, Bosnia. The street on which the Virginia National Guard Armory in Charlottesville lies was also named Peregory Lane, in his honor. In 2016, the name of the street was changed to Peregoy in order to correct the spelling. The Albemarle County Board of Supervisors passed a resolution in April to declare his birthday "Frank Peregoy Day". ^ a b c d "Peregory, Frank D. entry". Medal of Honor recipients: World War II (M-S). United States Army Center of Military History. August 3, 2009. Retrieved August 23, 2010. ^ a b c d Maurer, David A. (April 3, 2016). "Misremembered: Effort Launched To Correctly Spell Hero's Name". The Daily Progress. Retrieved December 15, 2016. ^ Slaughter, John Robert (2009). Omaha Beach and Beyond: The Long March of Sergeant Bob Slaughter. Voyageur Press. p. 230. ISBN 9780760337349. ^ a b Amhara, Cherney (April 10, 2016). "Virginia street honoring Medal of Honor soldier misspells his name". WHSV. Retrieved December 8, 2016. ^ "City of Charlottesville : Tech. Sergant Frank D. Peregory". www.charlottesville.org. Retrieved December 15, 2016. ^ "116th Infantry Regiment (Stonewall Brigade) Lineage and Honors". 116th Infantry Regiment Foundation. 13 November 2001. Archived from the original on 9 May 2008. Retrieved 23 October 2016. ^ a b Maj. Cotton Puryear (June 10, 2010). "Virginia Guard Medal of Honor recipient from Charlottesville remembered 66 years later". Virginia Army National Guard. Retrieved August 24, 2010. ^ a b "GlobalSecurity.org: 29th Infantry Division". GlobalSecurity. Retrieved 2009-07-02. ^ "Frank D. Peregory". Claim to Fame: Medal of Honor recipients. Find a Grave. July 25, 2001. Retrieved February 22, 2010. ^ "Federal Register" (pdf). June 16, 2006. Retrieved August 24, 2010. ^ "The Talon" (PDF). Task Force Eagle. February 6, 2004. p. 5. Archived from the original (pdf) on 2004-02-16. Retrieved August 24, 2010. Joseph H. Ewing. 29th Infantry Division: A Short History of a Fighting Division. pp. 30–31. "29th Infantry Division Historical Society". Retrieved August 23, 2010. "American D-day". Retrieved August 23, 2010. "Frank Peregory gravesite". Retrieved August 23, 2010. "Frank D. Peregory". Hall of Valor. Military Times. Retrieved August 23, 2010. "Technical Sergeant Frank D. Peregory". Retrieved August 23, 2010. J. J. Prats (May 3, 2009). "Technical Sergeant Frank D. Peregory". The Historical Marker Database. Retrieved August 23, 2010. "Virginia Guard commemorates 66th anniversary of D-Day this weekend". Virginia Army National Guard. June 3, 2010. Retrieved August 23, 2010. "Peregory, Frank D." Congressional Medal of Honor society. Retrieved August 23, 2010. This page was last edited on 10 November 2018, at 15:47 (UTC).